Let's take a moment to appreciate that the "zombies" of this AI test are, in fact, an old guy with a beard. This, then, is either the future of DayZ, or a chilling vision of a care home riot. 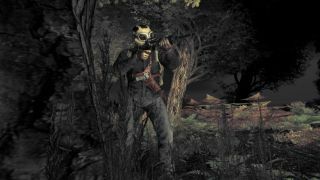 In a status report to the DayZ blog, lead producer Brian Hicks goes over some of the new features the team are working on. Partly that means multipurpose barrels—placeable containers that can be used for storage, as a rain-catching device, or as cover against incoming fire. But also, Hicks shows some of the work being done to zombies. "Again - this is very early implementation," writes Hicks, "however as work progresses into the next week the design team are working on sneaking and stealthy tactics when dealing with this new A.I. system. Moving into the next experimental branch window, we’ll be looking at pushing the early implementation work out to this branch and testing with varied numbers across all servers."